I'm a blue-collar waterfowler. Oh, there was that three-year span when Ken and I leased a tailwater pit in the corner of an irrigated milo field for $20 a year and three days of driving grain trucks during the harvest. The shooting was remarkably good on that puddle, too, but it wasn't what I think of when well-heeled hunters start talking about slaying mallards on "the lease." Except for that brief adventure into the rarified world of leasing, I've spent the bulk of my time on publicly owned areas, trying to figure out where the birds are likely to be and where the hunters aren't. In all those years, I've had a couple of periods of flat-out, guaranteed duck killing. Many years ago, I hunted a small marsh that a state wildlife agency had bought with federal drought-relief money. It was 60 miles from the nearest town of any size, so for the first three years it was in state ownership, a dozen of us had it to ourselves. The shooting was nearly always good, but the time I liked best was late in the season after a cold front and a couple of inches of snow. Twenty miles to the north, a spring-fed creek meandered through the prairie, and when the weather got sharp, huge flocks of mallards roosted on the creek every night and came out in the morning to feed in the irrigated milo and corn stubble to the south. About 9:30 in the morning, they had eaten their fill and were headed back to the creek in desperate need of a drink. I'd cut a hole in the new ice and set a dozen blocks. It was the one dark, liquid spot in a hundred square miles of snow. The mallards materialized out of the clear blue sky and fell into that open spot like teal. A few years back, I found a string of potholes that shrank almost to nothing in the summer. Come September, the state filled the flowage from a shallow lake upstream. The water generally came in slowly, encouraging a lush crop of smartweed on the mudflats. By October, the birds were on that marsh like bees on clover. Of course, all good things must pass--my first honey hole was inevitably discovered by scores of hunters and the pressure convinced the ducks to go elsewhere. More recently, my smartweed marsh has been wiped out by a decade of drought. Still, the shooting in those places was just about as good as it's possible for waterfowling to be. I'd like to think my success was entirely the result of my exceptional skill, but I had an advantage that had nothing to do with my calling technique. I was shooting over bait. In fact, nearly any time a duck sets its wings and drops out of the sky, there's some sort of bait below. On one of my sweet spots, the lure was convenient water, which is a powerful attraction for any duck or goose; on the other, it was naturally produced food. My spread and calling helped, but the only reason they were close enough to decoy was the food and/or water concentrated in that place. Truth is, nearly all ducks and geese are killed over some sort of "attractant," which is to say, bait. This isn't typical of most other kinds of hunting. Yes, some black bears and a considerable number of whitetail deer are shot legally over bait, but most big game hunting and nearly all upland hunting requires the hunter to go to the game. This search generally occurs in relatively large tracts of habitat, and the quarry can be almost anywhere. Unless the hunter is skillful, the game will know he's coming and look for a way to escape. In these situations, hunters spend a lot of time looking at the south end of a northbound critter. 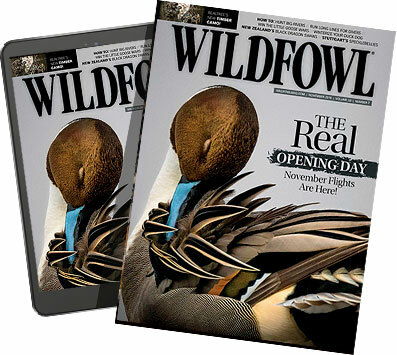 Perhaps the greatest single virtue of waterfowling is that the game comes to the hunter, which allows us to see web-footed quarry in a way we seldom see a pheasant, quail, or cottontail. We get a chance to watch the aerial ballet over the decoys because we're sitting on something the birds want. At the same time, this unusual situation presents waterfowlers with an ethical problem that would cross Solomon's eyes. We have to decide which kinds of attractants--bait--are okay to use and which kinds give us an unfair advantage. (2) place or direct the placement of bait on or adjacent to an area for the purpose of causing, inducing, or allowing any person to take or attempt to take any migratory game bird by the aid of baiting on or over the baited area." With those words, the baiting debate passed from the gray of philosophical dialogue into the black and white of law. It's understandable that baiting became the subject of an international treaty. Along with the live decoys and jacklighting, it is one of the most deadly techniques ever devised for killing waterfowl. That may be why a handful of throwbacks have applied so much thought to finding a loophole in the rules or just breaking them. In any case, the baiting regulations as they stand today are a monument to the outlaw's efforts to get around the law and the federal agents' effort to enforce it. Waterfowlers can't legally spread feed to attract ducks and geese. Once an area has been baited, it can't be legally hunted until ten days after the last of the bait has been eaten or otherwise removed, which gives the birds time to erase the expectation of finding food there. Notice that the regs don't make a distinction between the guy who spread the bait and other people who are hunting over it. If a hunter knows an area has been baited, he can't legally hunt that area until 10 days after the bait is gone. And ignorance isn't necessarily a defense-- if the hunter reasonably should have known that the area was baited, he can't legally hunt there. This last nuance is particularly troublesome for people who are regularly invited to hunt ducks or geese in places and with people they don't know well. One of the most famous arrests was made 10 years ago when Bud Grant, retired coach of the Minnesota Vikings and an ardent conservationist, was cited for shooting snow geese over bait in Nebraska. Turns out that state tourism officials had arranged the coach's hunt as part of a visit he had made to appear in two promotional films for the state. No one asked the outfitter whether the field had been baited or checked the ground when the party walked into the goose blind before light. Grant was later cleared of the charge. ually intense feeding activity that suggests baiting. If you're a little confused about the legal definition of "reasonable," you're not alone, but it's probably worth bearing in mind that you may be arguing the point with a federal judge. If you're in doubt, you may want to leave the gun in the case. Another definition that's been hotly debated is the meaning of the word "bait." The federal definition is "salt, grain, or other feed," which leaves holes big enough to run a johnboat through. The regs go on to make an exception for "normal agricultural operations." It is legal, for example, to hunt waterfowl over standing crops, even if they are flooded. You can legally hunt even when there is grain or seed on the ground as long as it is there "solely as the result of a normal agricultural planting, normal agricultural harvesting, normal agricultural post-harvest manipulation, or normal soil stabilization practices." Confused about the word "normal"? Generally, Fish and Wildlife defers to the Cooperative Extension Service on this matter--if those folks say the ag practice is normal, the Fish and Wildlife Service will usually agree. Usually. A crop that has been manipulated before harvest is considered bait. What does "manipulated" mean? Good question. A freshly planted wildlife food plot is considered bait. What does "freshly planted" mean? Fish and Wildlife offers a nine-page document on waterfowl baiting, which you can find online at www.fws.gov/le/HuntFish/waterfowl_baiting.htm. After a thorough discussion of the topic, it offers a list of offices that have more information, and that's good, because, once you've read the document, you'll have more questions. The enforcement of regulations against waterfowl baiting is as tangled a mess as you'll find in modern conservation. On one hand, there are outlaws who are doing their damnedest to break the spirit as well as the letter of the law without getting caught. On the other hand, there are state and federal wardens who are doing their damnedest to catch the bad guys. In between are tens of thousands of waterfowlers like you and me, doing their best to understand a Byzantine set of laws and abide by them. Here's hoping we don't get caught in the crossfire.